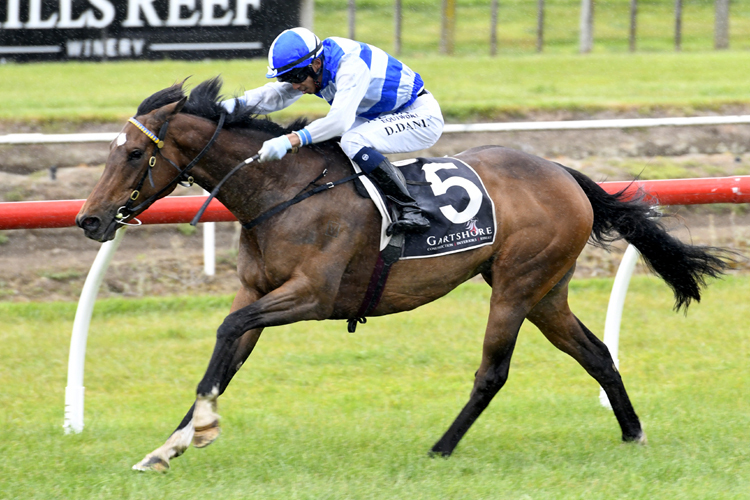 Talented mare Sleeping Beauty proved too slick for her rivals when she led all the way to take out the day’s open sprint contest over 1300m at Tauranga. The lightly raced six-year-old was registering her eighth victory from just 17 career starts as she defied race favourite Embellish and former Hong Kong galloper Your Way to run her down in the home straight after dictating the pace throughout. Sleeping Beauty relished the rain affected footing, rated as a Dead4, with co-trainer Andrew Scott content to extend her current campaign while the tracks remain with some moisture in them. “She’s quite incredible as she has had a long winter campaign but is coming up like a spring horse,” he said. “At her last race she ran 1.12 (for 6 f) which was a personal best and again today she has run a wee bit of time. “She has really turned in the coat and is carrying good condition. Condition means speed as she is quickening on top of the ground and showed a good turn of foot. Scott was quick to admit that the race had panned out well for Sleeping Beauty when the likely pacemaker Rich Billie Marsh was slow away which allowed his charge the luxury of a cheap lead in the early stages. “I think that was the winning of the race,” he said. “She got a couple of soft sectionals where everyone else was looking for Rich Billie Marsh while we were in front doing very little. Scott was also pleased with the fourth placed run of former Hong Kong galloper Giovanni Canaletto, who was having his first race for over two and a half years, while last season’s Gr.1 2000 Guineas winner Embellish lost no admirers with a handy effort in the first race of his four-year-old campaign.